In case you haven’t noticed it, by default Fundsupermart only offers an indexed return graph in the fund’s information page. That may be useful if you only bought the fund at its initial offering and plan to keep it until it divests itself. However most of us only start investing after the fund in question have gained a significant size and thus been around for quite some time. Thus we need the price graph to help decide when is a good time to buy and at what point we should sell. Fortunately Fundsupermart does offer this information but it’s not in a convenient graph form – it offers a historical list of prices and valuation dates and goes back to about three months. In this post, I’ll outline three ways to get a line graphs of the historical prices. 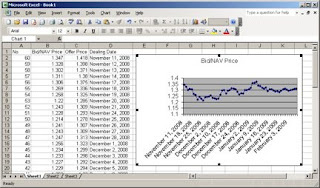 This option involves finding the fund’s historical prices page and use Microsoft Excel to download the data and format it into a nice line graph. 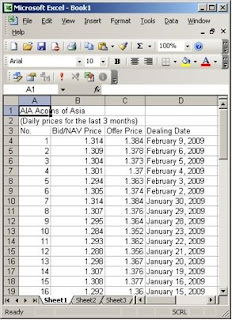 Although the example was made using Firefox and Excel, the idea is similar for other brands of web browser and spreadsheet. 1. Go to the Fundsupermart website. 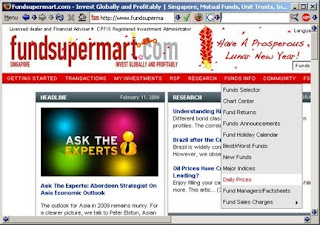 For Fundsupermart Singapore this will be http://www.fundsupermart.com.sg – replace the trailing country top-level domain in the end of the URL with HK for Hong Kong and MY for Malaysia branches. 5. 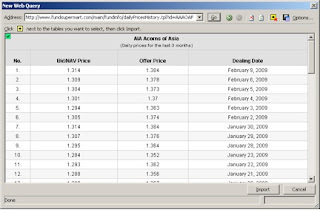 Take note of the Address field – this contains the URL of the price history page. 8. 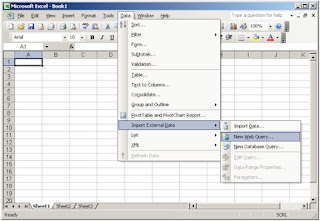 Import into the current worksheet and use cell A1 as the destination. 9. 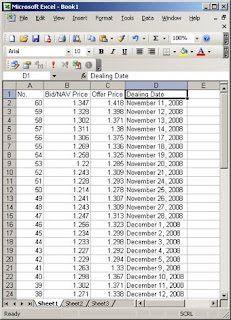 Delete the first two rows and sort the table so that the dealing date is arranged increasing order. I used the “No.” field and sort descending. 10. 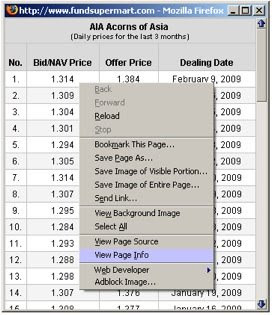 Select the “Bid/NAV Price” column and then create a line chart from it. There you have it, a three-month price history chart from Fundsupermart. If you happen to use a Mac computer, there is a dashboard widget that displays fund prices from Fundsupermart Singapore. The widget’s name is (straighforwardly) Fundsupermart Widget and available from this web site as a free download. For those that have an iPhone (or iPod touch with Internet connection) may use Fund Watch to monitor Fundsupermart prices via your iPhone (or iPod touch) application from the App Store. Being a commercial application, Fund Watch supports all four regions of Fundsupermart: Singapore, Malaysia, Hong Kong, and India.